Search for the best flight prices from Manchester to Mumbai. Compare prices, book today and save money with Manchester Airport. 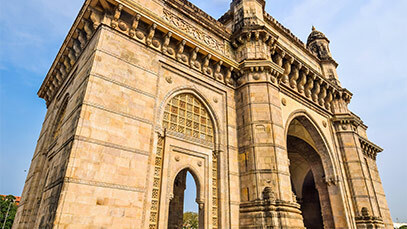 Vibrant Mumbai is the gateway to India and offers a lively and varied introduction to the country to visitors. If you took the art deco style of Miami and the hustle of New York, mixed them up and transplanted them to India, you’d have something close to Mumbai. A city of 22 million people, it’s one of the most densely populated urban centres in the world – a city of dreams, glamour and enormous contrasts. 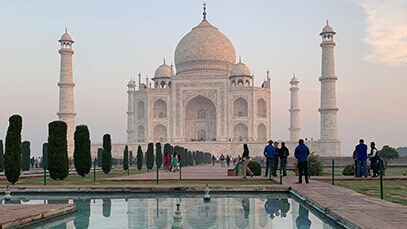 A thoroughly modern city built on commerce – including the Bollywood film industry – it’s also home to some of India’s most iconic sights and most delicious food. Next to the Gateway to India and a few steps from the attractions of Colaba and Fort, the Taj Mahal Palace is Mumbai’s iconic heritage hotel. Previous guests are a Who’s Who of royalty, heads of state and celebrities. Rooms in the main Palace building offer opulent comfort and views of the sea, the hotel pool or the city. The Trident Nariman Point has a stunning location at one end of Marine Drive, overlooking the Arabian Sea and the “Queen’s Necklace”. Rooms are crisp and clean - try to get one with a sea view. Abode was Mumbai’s first boutique hotel and is still one of the best. A can’t-be-beaten location in Colaba, tranquil atmosphere and stylish interior design make it a great option in the heart of southern Mumbai. When you’re in Mumbai, don’t miss the street food. There are street food stalls all over the city – for the best experience follow your nose and pick the stall with the longest queue. One street food dish all visitors must try is Vada Pav. A kind of vegan burger made with battered, spiced mashed potato and served in a soft white bun, it’s a Mumbai speciality. In the heat of Mumbai, a refreshing iced Gola is the perfect treat. A Mumbai Gola consists of a ball of crushed ice, dipped in flavoured sherberts and sometimes topped with fresh cream, nuts and fruits. Like Vada Pav, you can find Gola stalls all over the city, but you’ll find some of the best in Juhu Chowpatty, on Marine Drive and in Shivaji Park. The Leopold Café and Bar is an iconic Mumbai restaurant, situated in the Colaba area, close to the Gateway of India and the famous Colaba Market. The varied menu includes Indian specialities as well as pasta, risottos and burgers. Run by a French trained pastry chef, Le 15 Patisserie café brings a taste of Paris to Mumbai. Visit for tempting cupcakes, macarons and signature ice creams. The Kala Ghoda Arts Festival has been growing in popularity and international attention for the last few years and claims to be India’s largest multicultural festival. The festival encompasses cinema, dance, theatre, food, literature, comedy, music, visual arts and children’s activities. All events are free to attend. August sees Mumbai celebrate a number of religious and cultural festivals, including Parsi New Year, Raksha Bandhan (the celebration of brothers and sisters) and Nariyal Poornima (the fishermen’s festival). September is another busy month in the Mumbai calendar. The festival of Ganesh Chaturthi, devoted to celebrating the elephant god, takes place across India but in Mumbai the city pulls out all the stops. The best place to witness the festival is on Chowpatty beach, where you’ll see processions along the beach with Ganesh statues being immersed in the sea. Also in September, the exuberant festival of Krishna Janmashtami celebrates Lord Krishna’s birthday. Try to find a rooftop to watch human pyramids break open clay pots suspended from buildings. A nine-day festival, Navatri sees nine consecutive nights of parties devoted to various goddesses. Circular dances are performed in venues across the cities – buy a ticket in advance. At the end of the nine days and nights of Navrati, Mumbai celebrates the triumph of good over evil on a day known as Dussehra. Enormous effigies of Rama, the seventh incarnation of Lord Vishnu, are paraded and then burnt in lavish spectacles. Hindu New Year, or Diwali, is celebrated across India. Otherwise known as the festival of lights, Diwali sees people stocking up on oil lamps as excitement build. For visitors, head down to Marine Drive for enormous firework displays symbolising the triumph of light over darkness. Christmas is a popular event in Mumbai, celebrated not only by the city’s large Christian community in Mumbai but also by those of other faiths. Mumbai has several fine churches, including the city’s Cathedral, and they’re spectacular settings for Midnight Mass on Christmas Eve. Overlooking the Arabian Sea, the Gateway of India dominates the port area of Mumbai. Built in 1911 for the visit of King George V, it’s a major draw for tourists and a Mumbai icon. Mumbai’s enormous, UNESCO World Heritage-listed train station is one of the city’s most impressive sights. A combination of Victorian Gothic and Indian tradition, it’s a must-see in Mumbai. Haji Ali Mosque’s picturesque setting on a tiny island off the coast of south Mumbai has made it one of the city’s most famous sights. If you decide to visit, check the tides – the causeway linking the mosque to the mainland is only passable at low tide. Opened in 2009, this enormous golden meditation hall is a stunning sight to the north of Mumbai. It’s one of the largest stone monuments in Asia and has the largest dome in the world. 8000 people at a time can meditate in the main hall. Take a 1 hour ferry to Elephanta Island and visit the mysterious caves. The Elephanta Caves are another UNESCO World Heritage Site and consist of one large and six minor caves, all richly decorated with rock carvings dating back to the 7th century. If you enjoy your visit to Elephanta, take a trip out to the western outskirts of Mumbai and see the stunning Kanheri Caves in Sanjay Ghandi National Park. The Kanheri Caves are even older – dating back to the first century BC – and are set in an area full of gorgeous forests and waterfalls. Dhobi Ghat is the world’s largest laundrette. Thousands of clothes pass through here everyday, being washed on the 700 stone washing platforms and dried in the sun as they have been for generations. It’s a real one of a kind, only-in-Mumbai sight. In the Marine Drive area, nicknamed the “Queen’s Necklace” for its curving shape, you’ll find Chowpatty Beach. This is a beach for having fun rather than lazing on the sand – during the day you’ll find street food and a buzzing atmosphere, while at night the beach transforms itself into an open-air fair where locals meet for after-work snacks and fun. Antilia is the name of the world’s second most expensive residence (after Buckingham Palace) and the world’s most expensive private house. Completed in 2010 at a cost of over a billion US dollars, the house has 27 floors and is occupied by a single family and 600 staff. It isn’t possible to visit the house, but as one of the tallest houses in the world, it’s easily seen from the street. Newly-added to the UNESCO World Heritage list in June 2018, Mumbai boasts one of the largest collections of art deco buildings in the world. Juhu Beach is one of the most popular places in Mumbai and offers the perfect place to enjoy the sea breeze, soak up some sun and taste some of the best street food snacks Mumbai has to offer. As the sun goes down, it becomes a lively meeting-spot for locals. Neighbouring Versova Beach has undergone a concerted clean-up effort in recent years and is now home to nesting turtles. Unless you’re travelling on a shoestring, you’re unlikely to find local buses very useful for your visit to Mumbai. One exception is the Nilambari heritage double decker bus which runs from Chatrapati Shivaji Maharaj Vastu Sangrahalay, Gate No.4, near the Gateway of India on Saturday and Sunday evenings. 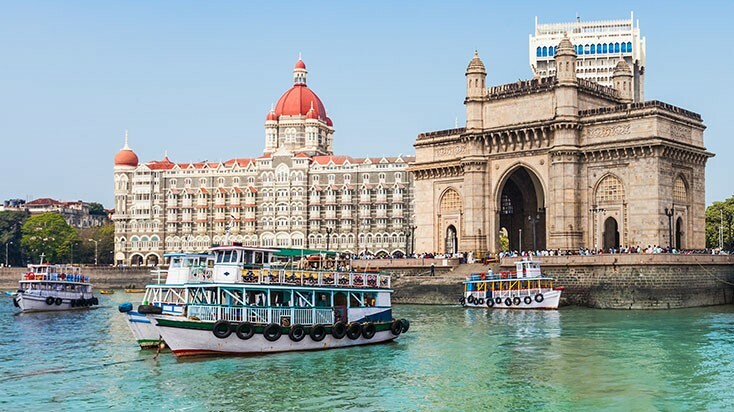 The circular route takes visitors past many of Mumbai’s greatest sights, including Marine Drive, Chhatrapati Shivaji Terminus and Rajabai Clock Tower. Tickets for the open upper deck cost around £2. Taxis are cheap and convenient, particularly in south Mumbai. Taxi apps like Uber and Ola have made finding a taxi even easier in recent years. When taking a taxi, it’ll help to know the names of some landmarks near your destination, as these are more commonly used for navigating around the city. If you want to travel out of Mumbai for a day trip, consider hiring a car with driver. An air-conditioned car should cost less than around £20 per day. Jet Airways fly direct flights from Manchester to Mumbai five times a week. 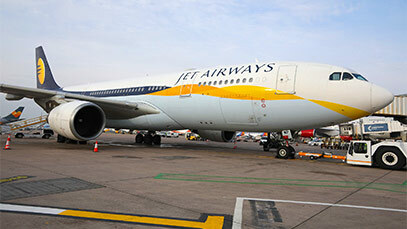 Jet Airways’ modern Airbus A330-200 aircraft make the 4,500 mile journey in less than 10 hours. From Mumbai you can connect to flights to destinations within India and beyond. Jet Airways flights from Manchester will land at Mumbai’s state of the art Chhatrapati Shivaji International Airport (BOM). This is Mumbai’s main international airport and was named one of the world’s best airports in 2017. Mumbai Airport is 16 miles north of the Fort area of Mumbai, where the Gateway to India, Chhatrapati Shivaji station and other historic buildings are located. The easiest way to travel from Mumbai airport to downtown Mumbai is by taxi. For the reassurance of a set price, use the prepaid taxi desk in the arrivals area where you can book and pay for your taxi in advance. All fees and tolls are included in the price. Alternatively, you can take a bus, rickshaw or taxi to the nearest train station and from there take the train to the city centre. Is it any wonder why Mumbai is the epicentre of Indian fashion? The city’s focus on combining modern life with the past translates perfectly to the fashion scene - creating unique garments that can only be found in the many markets and boutiques that sprawl across the city. If fashion isn’t your thing, there’s plenty of other antiques, souvenirs and more to be found in the Chor Bazaar. The Bazaar's name translates to 'Thieves Market', and it has a reputation of offering unique hidden treasures.